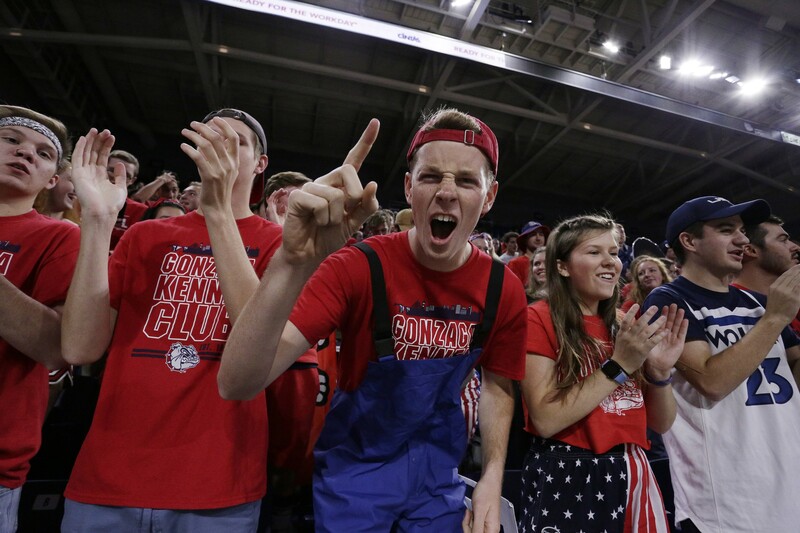 Gonzaga fans cheer before an NCAA college basketball exhibition game. Zag fans should be hoping that luck has run out for the underdogs in Las Vegas. The No. 1 seed, Gonzaga, and the No. 2 seed, Saint Mary’s, enter the tournament during Monday’s semifinal round and face off against whichever teams survived the first three days of madness at Orleans Arena. And it has indeed been three days of madness. Before the start of this season, the West Coast Conference announced a number of changes to the way it schedules for basketball, among which was some tweaking of the conference tournament format. Starting this season, the four teams with the worst records in conference play would take part in the tournament’s first round, which happened on Thursday. On Friday, the winners from the first round would face off against the teams seeded No. 6 and No. 5. The winners of those games moved on to Saturday, when the teams seeded No. 4 and No. 3 joined the fray. If the tournament went according to seeding, the 3 and the 4 would advance to face the 2 and the 1 seeds. But, BYU and San Francisco, the 3 and the 4 respectively, got blown out on Saturday. If not those two, then probably the 5 and the 6. But nope, they’re gone too. The No. 7 seed, San Diego, and the No. 8 seed, Pepperdine, have won three games over the course of three days to advance from the tournament’s first round into the semifinals. And both teams have done so in impressive, exciting ways. San Diego, a team Gonzaga won’t face until Tuesday, if at all, has done so on the defensive end. The Toreros held Portland to 47 points in Thursday’s tournament opener before holding Santa Clara to just 45 points on Friday. Against BYU on Saturday, they gave up 57, but that’s well below the Cougars’ average of 87.9 points per game this season. San Diego led by as many as 44 points in the game. It was as dominant of a performance as is possible on the basketball court. On Monday, San Diego will look to take down the Zags’ traditional nemesis, Saint Mary’s. Zag fans, I’m sorry to say but it’s time to root for your rivals. You don’t want to see the senior-laden and highly motivated Toreros on Tuesday in the tournament final. Pepperdine, which faces Gonzaga Monday night in the semis, has gone to work on the offensive end of the court in Vegas. The Waves have poured in 31 three-pointers so far in the WCC Tournament, three shy of the single-tournament record of 34, set by Gonzaga last year. And, that’s no surprise. Pepperdine leads the WCC in three-point percentage at 38.2 percent — Gonzaga, for comparison, is shooting 36.7 percent from three this season. On Saturday in the quarterfinals, against one of the best defensive teams in the league, the Waves shot 50 percent from three and 54 percent from the field. They blew out San Francisco 89-72. The Waves are a young team with a roster loaded with freshmen led by a sophomore: First Team all-WCC point guard Colbey Ross. Recently though, they haven’t looked young. With nearly a full season under their belt at this point the team isn’t making rookie mistakes. If this is what the Waves look like going forward, they will be a force to be reckoned with in the WCC in seasons to come. So far in the Waves’ three tournament games they came out swinging. In each of the last two games Pepperdine opened by making five of its first seven shots. On Saturday, the Waves made their first four three-pointers. After those red hot starts they cooled off only slightly. For a team with a 16-17 record for the season they will prove to be quite a test for Gonzaga’s steadily improving defense. All that said, the Zags are the heavy favorites tonight and tomorrow. Since the tournament moved to Orleans Arena in 2009 the Zags have compiled an otherworldly 23-2 record in the event and have won 17 straight games. The last time the Zags failed to make it to the WCC Tournament Final was in 1994.